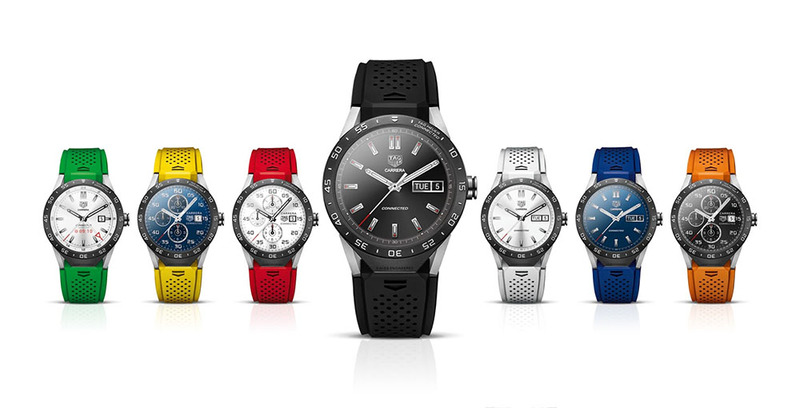 TAG Heuer announced its first smartwatch this morning and it is indeed called the TAG Heuer Connected. Made in partnership with Google and Intel, this is the first time we have seen a Swiss watchmaker take on the smartwatch category. The watch has the smarts of Android Wear, which you knew, since it was built as an Android Wear device. But as a luxury watch, it has a titanium case, “signature” strap that comes in seven different colors, and a high-resolution, “transflective” sapphire glass display. It also features a bunch of TAG Heuer dials or watch faces, so you can make this look like a normal TAG watch. Edit: Here are more specs. The Connected has a 1.5-inch circular LCD display (360×360, 240ppi) with sapphire crystal, 46mm Titanium Grade 2 case that is 12.8mm thick, IP67 water resistance, vulcanized rubber strap, 410mAh battery, 1.6GHz dual-core Intel processor, 1GB RAM, 4GB storage, Bluetooth 4.1, and WiFi. Full specs. The press event is still going right now and no one has mentioned price ($1,500 is the latest rumor), (Edit: It is Indeed $1,500) only that it will be available today in 20 select boutiques. We’ll update this as we have more. Update 2: At noon Eastern, you should be able to buy the watch at TAG’s site or select boutiques. Here is a direct link to the Connected on TAG’s site. 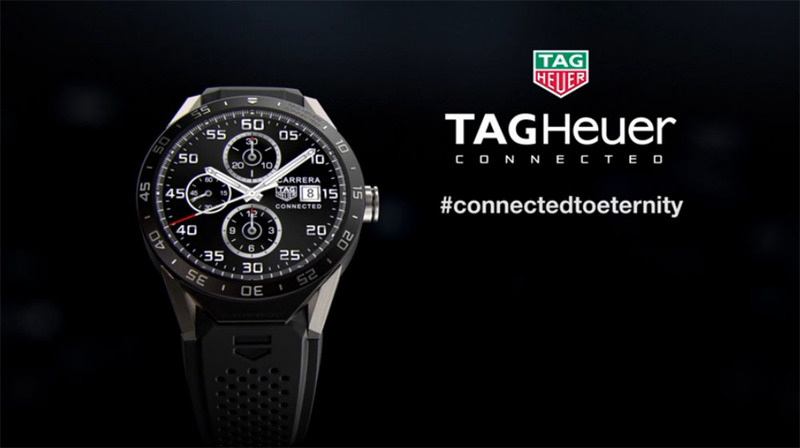 Update 3: In some of the first conversations TAG Heuer made public about the Connected, they talked about it being upgradable over time on some level. They briefly talked about that today, saying that the Connected comes with a 2-year warranty. At the end of that 2-year period, when the watch is likely outdated and about to die, because that’s how technology like this works, you can trade it in, pay another $1,500, and they will give you a traditional TAG Carrera watch, which probably carries around a $3,000+ price tag at retail. We are looking for more details on this and will update as we have them. Update 4: Here is the full press release. New York, United States, 9th November 2015 – Today, TAG Heuer, Intel Corporation and Google unveiled a connected watch, designed by Luxury Swiss watchmaker TAG Heuer, engineered with Intel technology and benefiting from everything the Android Wear universe has to offer. The TAG Heuer Connected is a true watch, both in terms of its appearance, with its watch faces and its minute tracks, but also in its “interactive counters”, thanks to the unique way in which its applications are displayed. The watch also benefits from a two-year warranty, like other TAG Heuer watches. Finally anyone who purchases a TAG Heuer Connected watch will have the opportunity to exchange it for a mechanical watch with real Swiss movement inside. At the end of the connected watch’s two-year warranty period, customers can go to the TAG Heuer store of his or her choice to exchange the TAG Heuer Connected watch for a mechanical Swiss Made Carrera watch. With similar design, also made from grade 2 titanium, this mechanical watch has been exclusively developed and reserved for owners of connected watches. Its price is set at 1500 USD, 1’350 Euros, 1’400 CHF, 1’100 GBP. *TAG Heuer is the Swiss watchmaker that invented the oscillating pinion in 1887, the first chronograph accurate to 1/100th of a second in 1916, the first chronograph to go into space on the wrist of the American John Glenn in February 1962, of the Heuer Carrera in 1963, of the Monaco V4 in 2004 with the first movement driven by belts as fine as a hair, and of the TAG Heuer Carrera Mikropendulum in 2013 with the first magnetic chronograph.